Rishabh Pant exclusion from the 2019 World Cup squad came as a surprise but Dinesh Karthik's inclusion shouldn't be so because of his experience and everything else he brings to the side other than batting. Rishabh Pant versus Dinesh Karthik was a battle that went right down to the wire and in the end, it was Karthik, who just made past the finish line...much like games they have been part of for country or franchise. As India announced their 15-member World Cup squad on Monday, Karthik's inclusion over Pant surprised many, who had already gift wrapped the ticket to England and mailed it to the southpaw it seemed. But, their bets are wasted and no one can be blamed more than the person they put their money on. Much like his hands, the patience of the selectors, for now, seems to have gone off and it is yet again Karthik, who has to tie the loose ends. And that has led many to feel bad for the youngster and believe that India have missed a trick there. Let us run through some 'fine' numbers first and then I will point out a key aspect which perhaps has turned the tide in the Tamil Nadu wicketkeeper-batsman's favour. Since making his fifty-over debut, Pant has played five ODIs and scored 93 runs at an average of 23.2. In the same span, DK has managed to feature in the same number of matches and scored 75 at an average of 37.50. Karthik has fewer runs, ain't it? Yes, he does but in those five matches, he has been not out twice and taken the team home while for Pant, the number is 0. Telling. The numbers in honesty are not quite different but the ability and past records of hanging in there and ensuring your team wins games or post big totals is what makes Karthik a much better customer in crunch situations -- where Pant has more often than not thrown his wicket away. Pant's exclusion does take away the hitting prowess in the Indian middle-order but Karthik's inclusion gives it a wise head and a calm influence, something that is worth in gold when there is a collapse or a high-octane situation in a run chase. What also works in the 33-year-old's favour is what he brings into the field as a captain and a reader of the game. With the chairman of selectors MSK Prasad stating that either of Pant or Karthik only gets to play if Mahendra Singh Dhoni sits out, it is clear that the selectors were looking for someone, who can help the captain from behind the stumps and DK with all his experience is a much better candidate than the playful Pant, who surely is humorous but not at par with the old warhorse in reading the situation of the game. 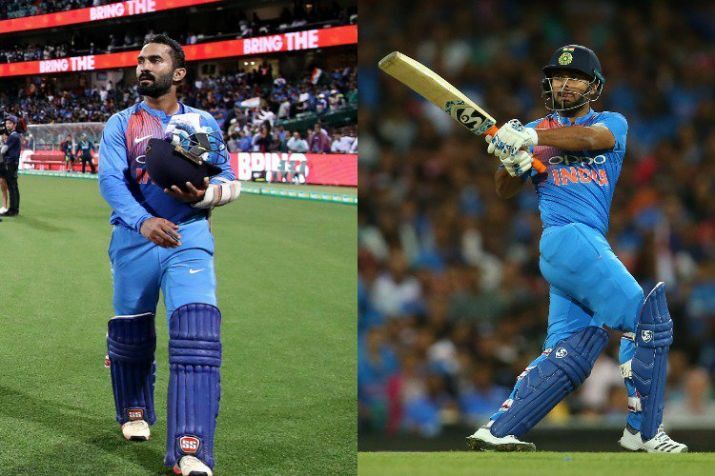 In short, both Pant and Karthik failed to grab their chances but the latter has just done better than the former in terms of what the team demanded and despite his axe against Australia earlier in the year, picking Karthik for the World Cup always made more sense until Pant did something to turn the tide in his favour. Karthik's inclusion is short-sighted surely but for the World Cup, you need your best 15, who can handle pressure and Pant is just not yet there despite all the talent he possesses. The 21-year-old is the future and remains the favourite to take over from MS Dhoni but Karthik is the present and they always say it is better to live in the present than worry about the future. Carpe Diem, you see.